A plaque identifies the location of an ancient Native American effigy mound in the shape of a bird near Observatory Hill. 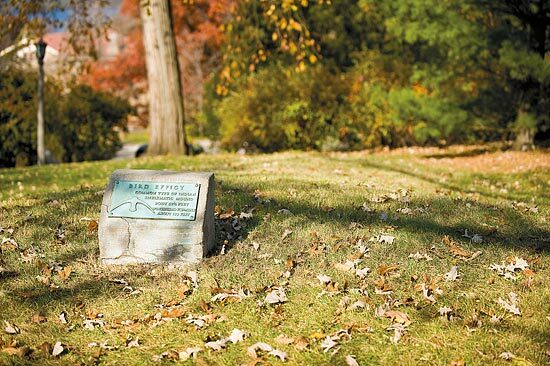 There are believed to be more burial mounds at UW–Madison than any other U.S. campus. Tucked in a tangle of Virginia creeper and garlic mustard, the barrow, a simple hemisphere of compacted soil, is lost to any but the most interested observer. Every day, scores of people amble or jog past the desk-sized structure on their way to the tip of Picnic Point unaware that a human monument — perhaps as ancient as Egypt’s pyramids — is within arm’s reach. Hidden in its leafy niche, the mound is one of dozens of very old and still sacred burial mounds found on the UW–Madison campus. Together with the much larger and more enigmatic effigy mounds, the tumuluses represent a unique signature on the landscape, inscribed hundreds or thousands of years ago by native peoples for reasons archaeologists, Native Americans and others still debate. But one thing is clear: There are more of the earthen monuments in greater variety on the UW–Madison campus than any other university or college campus anywhere in North America, and probably the world. Daniel Einstein, program manager of the Lakeshore Nature Preserve, is pictured near the location of an ancient Native American effigy mound near Picnic Point. Throw the Arboretum into the calculus, and today there are 38 effigy and burial mounds in six groupings on the UW–Madison campus (five groups are no longer visible/destroyed). At least 14 more have been lost to development. One large mound on Bascom Hill, ironically the location of Madison’s first cemetery for early white settlers, was leveled when Bascom Hall was constructed in 1857 and at least two mounds were destroyed when Agricultural Hall was built in 1901. Today, the mounds are protected by law, and they remain important to Native Americans. The occasional offering of tobacco, wrapped in patterned cloth and tied to the branch of a nearby tree is a silent testament to the spiritual significance of the mounds to American Indians today. In the Midwest, there are at least 15,000 of the earthworks, built between 350 and 2,800 years ago. Wisconsin, in particular, was a place where native people left their mark on the landscape by constructing edifices for burial or, perhaps, when it came to effigy mounds in the shapes of animals, birds and spirits, for the benefit of totemic relationships: “There are more in Wisconsin than elsewhere. In terms of density of earthworks, we’re at the top of the heap,” according to Rosebrough. In the Madison area, which must have been a busy place in prehistory, there are an estimated 1,300 extant effigy mounds, including the world’s largest known bird effigy, with a wingspan of 624 feet, on the grounds of the Mendota Mental Heath Institute. But sadly, most of the Midwest’s burial and effigy mounds have been destroyed by 175 years of agricultural, urban and rural development. Others were — and continue to be — lost to the depravations of illegal prospecting for artifacts and some were destroyed by early archaeological investigations. Getting to know UW–Madison’s cultural landscape, including effigy mounds and archaeological sites, can be accomplished with a few clicks to the right Web portal. The Web site of the Lakeshore Nature Preserve has information about effigy mounds and natural and historic features on campus. Finding those campus resources is easy as the site includes a detailed, multidimensional interactive map that lets users zoom in on any of UW–Madison’s notable landmarks, including effigy mounds, natural features such as topography, soil and vegetation, and vanishing and surviving historic features. The map, produced by the Cartography Lab, was developed by Rob Roth, Andy Woodruff and Joel Przybylowski under the direction of history professor Bill Cronon and geography professor Mark Harrower. The effigy and burial mounds on campus are, of course, only part of the story of a landscape that has been occupied by humans since shortly after the last glaciers retreated from the region 12,000 years ago. The question of who the mound builders were remains a contentious one with no definitive answer, but research by anthropologists, linguists, historians and archaeologists as well as native oral histories suggests that the ancestors of the Ho-Chunk, Iowas, Dakotas, Otoes and Missouris built the mounds in Wisconsin and nearby states. There are numerous sites on the Lakeshore Path, Picnic Point, University Bay Marsh and Eagle Heights where it is known that ancient Midwesterners lived, worked, raised families and exploited an ample and diverse natural resource base. A recent survey by archaeologist George Christiansen III and funded by the Getty Foundation, part of a larger cultural survey of the UW–Madison campus, revealed a much denser concentration of archaeological sites than was previously known. The distribution of effigy mounds in the Midwest, according to Rosebrough, neatly matches the extent of oak savanna environments. Sites seem to have been chosen for a view: “Many effigy mounds are placed on high points overlooking water,” notes Daniel Einstein, the manager of UW–Madison’s Lakeshore Nature Preserve. The two most spectacular effigy mounds on campus are a bird and a two-tailed water spirit, once mistaken for a turtle and still so identified by a nearby bronze plaque. Both are situated just to the east of the Washburn Observatory and overlook Lake Mendota. It’s clear that the past 150 years have not been kind to the monuments ancient Midwesterners left us. The university, in fact, frequently confounded the efforts of Wisconsin’s first state archaeologist, Charles Brown, who Rosebrough credits with preserving the vast majority of Madison’s Indian burial and effigy mounds in the first half of the 20th century. “He’s the reason we still have mounds in Madison,” Rosebrough asserts, noting that Brown successfully resorted to the grassroots tactic of recruiting women’s groups to fight for preserving the earthworks. “But the university caused him a fair amount of frustration” by insisting on building on mound sites. Today, things are better, and the university has made some investments in mapping, preserving and maintaining the mound groups on campus. This past winter, staff from the preserve and the campus grounds department, cleared away understory trees and the tangle of buckthorn adjacent to a notable group of effigy mounds between Willow Creek and the Natatorium. The ground layer was then restored this summer, with the help of student interns sponsored by the local Audubon Society chapter. The effect has been to re-establish grasses and forbs beneath towering oaks — a landscape similar to what would have existed when the mounds were built. The mound group, which includes an effigy goose, is one of the most important on campus, but was long neglected and, 100 years ago, was a popular site for outings with Sunday picnickers occasionally digging away at the mounds and a carriage track bisecting one of the wings of the goose mound. “Our history of stewardship has not always been faithful,” says Einstein.